A tonometer is a diagnostic tool used by an optometrist to measure the intraocular pressure (IOP) inside a patient’s eyes. A patient’s IOP can help an optometrist determine a patient’s risk for developing glaucoma — a disease that damages the optic nerve of the eye, usually resulting in vision loss or even blindness. A non-contact tonometer uses a small puff of air (which is why it’s many times referred to as the “puff test”) to measure an eye’s pressure. 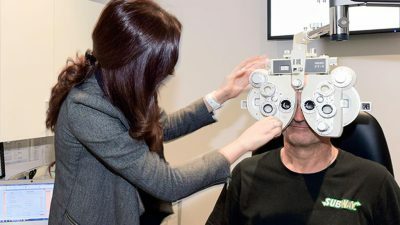 Known as pneumotonometry, the air puff flattens the patient’s cornea in a non-invasive way, meaning eyes do not need to be numbed prior to the test.